Fooled you. 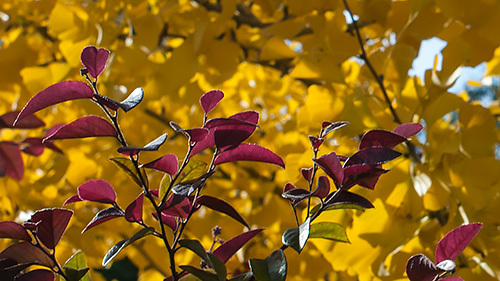 When we say "fall color" around here, we aren't talking about the leaves turning color as the light gets rationed. We're talking about cropping. 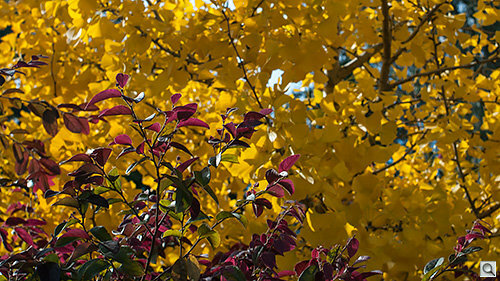 We turned the corner in Golden Gate Park the other day only to be blinded by this golden tree. We whipped out the Nikon D200 with the f2.8 35mm prime and a circular polarizer on it and tried to compose the shot. Horizontal, no. Vertical, no. Further back, maybe. No. Well, shoot it anyway and believe me later. We are sometimes patted on the back condescendingly by sympathetic visitors and told we don't have seasons here. Tell that Pacific Gas & Electric, which seems to know when our gas heater is blasting all day. We get some fall color too because, you know the whole earth tilts away from the sun, not just certain regions. You should see the wine country in fall, come to think of it. When you tire of looking at the leaves, there are always the tasting rooms to refresh you. Full Crop. Not quite it. So we had our color but we didn't like the picture. Our requirements for images here are rather modest, so we knew we could slice up the full crop significantly to see if we could find a better arrangement. It took us a while but we found a rather small crop of the original that we did like when viewed at this small size. It's not a bad exercise. So we're providing a higher resolution version (click on the thumbnail above) of the full crop image for you to play around with. It's not a bad crop at full size but the trouble begins when you resize the crop to 500 pixels wide. The trick is to find a crop at that size that isn't confusing to look at. There are a lot of right answers. And the activity may even keep you warm on a cold fall day.